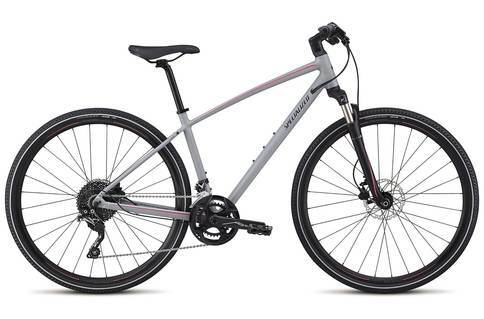 Peruse through the price routes for the Specialized Ariel. Specialized has really outdone itself with the Ariel, a bike that has been made specifically for women and is built to be a hybrid. This means that it is bound to give you the best of both worlds, because it is a hybrid bike that has been made for both the streets and the hills. The Specialized Ariel was a beautiful machine when we took a look at it. It has a wide price range, and is quite affordable at its most entry level spec. One of the main perks of the bike was that it was incredibly lightweight, which was very awesome indeed for traveling at speed. In addition to this, the model that we reviewed made use of disc brakes, which provide plenty of stopping power for downhill rides. The 29’ wheels were perfect at easing the pedaling on climbs, because the power transmission was also pretty great. Overall, we also took note of the design of the bike, which was very female-friendly indeed, with the geometry having been design specifically to fit the body of a female rider. Some complaints that we had included the not-so-comfy seat, the height of the bike, which was a little too much for a lot of shorter riders to handle, and the difficulty of the safety strap! The Ariel is a bike made for women that you can get even if you aren’t on the best budget ever. It is bound to serve you well no matter what use you put it to. We had the time of our lives reviewing the Specialized Ariel, with its gorgeous design and its awesome performance on the roads and on the trails. We liked it enough to forgo the complaints that we had in favor of its perks.